There are hundreds of bad habits flying around in society that makes culture as a whole, more fat that than we should be. If you’re overweight, that is a direct result of two things a) what you’re putting in your mouth and b) how healthy you are physically, i.e moving more. If you’re in a sedentary job then you will most likely be less energetic, healthy and be more likely to form bad habits. Below are the most common habits us men have which is making us fat. Change those into good habits and BOOM, you have yourself a healthier body. If you’re eager to shift the extra weight you have, then you should read this right now. Studies have shown that if you eat late night, you are more likely to put on weight. The reason is because the body finds it harder to break down the food and fully digest it after 8pm in the evening. Now this may sound bizarre, but binging late night will certainly give you a few extra pounds that you don’t want. Boredom is the biggest reason people snack and snacking is the biggest reason for weight gain. If you want to drop some weight, end the snacking. Unless… of course you’re snacking on cucumber sticks with hummus. But most people just aren’t doing that are they? It’s more like a handful of peanuts and a fistful of doritos. If you are not reading the ingredients list on the back of food in the supermarket then you’re an idiot. Why would you put something in your body that can make you fat, sick and shorten your life? I know, it’s a bit dramatic, but it’s true. Understand your daily recommended levels of calories, salt, sugar etc and stick to it. When exercising, you burn the most fat on an empty stomach. This means you need to wait at least 3 hours after eating before you can jump on a treadmill and benefit from the full fat burning effects of cardio. If you exercise whilst on a full stomach, then you will only be burning off the sugars as fuel from that food… not fat. 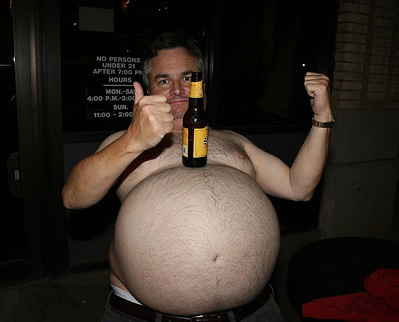 Beer is a very big cause for weight gain and water retention in the body. If you like going to the pub with your friends after work, then you’re going to hinder your chances of losing that flabby beer belly. Can You Really Get Fit In Only 7 Minutes A Day?